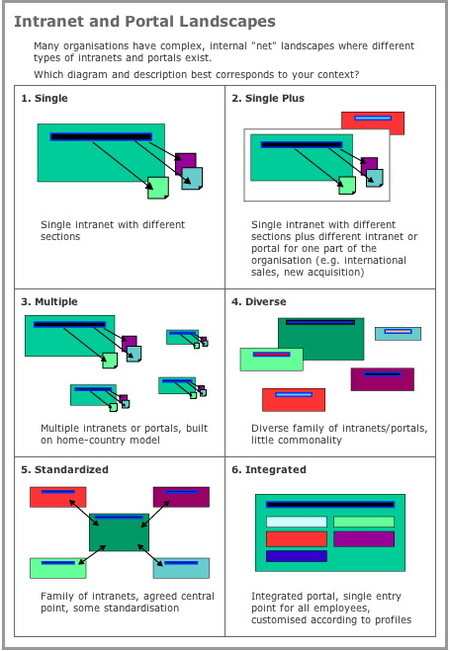 Over the past 5 years, I have been working on defining models for different types of intranets and portals. I have defined 6 types that I have tested with international companies, government, institutional and non-profit organizations. I have defined 3 evolutionary paths followed by most organizations. A the end of the post, I answer some key questions from a reader. The diagram is an extract from the 2007 Global Intranet Trends Survey. There is a lot to be said for each type: its history, its relation to organizational or business strategies, its relevance for users, and so on. The evolution from 1 to 6 is not systematic. In fact, intranets follow specific paths depending on the history of the organization and how it is growing, evolving, down-sizing, devolving, etc. This is typical of an enterprise that starts from a home country base or what I call a “single geography” context, and then either acquires other companies or is part of one or more mergers. The comfortable single geography intranet (1A) has now become part of a diverse set of intranets (1B) where it is not longer so easy to find content, to know where to publish, to even know which other intranets exist! The Center will try to take control of the situation. I’ve seen a wide variety of methods ranging from creating a global intranet team (the white hat approach) to decreeing rules from HQ and sending them out as an attachment to an email signed by the CEO (the black hat approach). Some of the landscapes will evolve to a more or less standardized family of intranets with agreements on roles and scopes for each (1C). In today’s world of information overload and web 2.0 opportunities, they may eventually move to a single-point of entry, possibly even a truly integrated portal over time (1D) but it will take time. Other landscapes may stay blocked for years, with frustration felt from the center and from the entities. The breakthrough will occur when they realize that it is the management and people who will make the changes happen, not the technology or the rules. This is typical of many enterprises born and raised in the US, then evolving into international and eventually global operations. The intranets in the different countries where the enterprise sets up will be built with the cookie cutter approach, or what we can call “cut and paste”, each one being a copy of the home country intranet, give or take a little (2B). If the enterprise has no acquisitions, participates in no mergers, continues its fairly controlled organic growth, and has a homogenous product or service offering worldwide, it may eventually evolve to an integrated portal, with a high degree of customization per country primarily for HR, administrative and logistical aspects. (2C). If any of the “ifs” above occur, it will likely deviate through a longer path including phases of the “diverse” model, moving to the “standardized” model before reaching the portal model. It will in fact have followed a path similar to the Red one, but possibly even longer because the “cut and paste” model will have momentarily created a comfortable illusion that “we all do things the same way”. This is typical of an enterprise or holding company created through numerous, nearly simultaneous, acquisitions. The intranet landscape is a mixture of very different, non connected sites, portals, intranets, even Notes databases (3A). If there is commonality among the businesses, the intranet may evolve to the standardized model (3B) although it will be very hard work. One day, the organization may decide it needs a single point of entry (3C). However, it is highly unlikely that it will ever become more than a thin portal with news from HQ and the businesses, multiple links to the information resources and intranets of the organization, and a corporate directory (although it will take years to include all the entities). It will primarily be a unifying layer of common information placed on top of the standardized model. One of my readers (hi Samuel!) has asked me to develop my comments on paths 2 and 3 in the diagram above. JMC response: In my experience, the majority of USA companies who expand abroad do so by following the path started at point 2A. They “impose” their intranet structure in a natural way (passing through the 2B cookie cutter stage) as they grow gradually. They usually have a strong IT culture and a high degree of self-confidence or “we prefer what is invented here” and are thereby able to achieve the move to an integrated portal relatively easily. European companies already have a strong sense of diversity, primarily coming from the geographical proximity of highly different cultures and ways of doing things. Personally, I have never seen the cookie cutter approach coming from a European headquartered multinational or global company. I believe this because unless the global company has a highly integrated business model, the final 3C point will be based on what is “common” to all employees of the global company and when you get right down to it, this is much less than one thinks from the theoretical or abstract viewpoint. 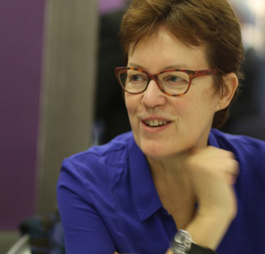 JMC response: I have not yet seen it. The one-by-one step is a hard one to pull off. Do you start with a big one, who will usually resist, sometimes successfully? Or with a small one, where from the global viewpoint, it does not make a lot of difference? How do you achieve critical mass? And once you’ve discussed the integration strategy and migration path with the key players, how do you establish priorities, timelines and functionalities such as search and indexing while ensuring that all entities are treated fairly, respectfully and without disrupting their day-to-day operations? Of course this can all be organised, but not, in my opinion, on a “one-by-one” basis. It requires well thought-out strategy with a maximum of communication, diplomacy and change management actions. Not the least of which must address the concerns of local senior managers who are “losing their intranets”! Thank you for pushing me with your questions, Samuel. Keep them coming. Previous PostWhat keeps senior management awake at night and what is your intranet doing about it? Next PostThings are getting better, aren’t they … ?